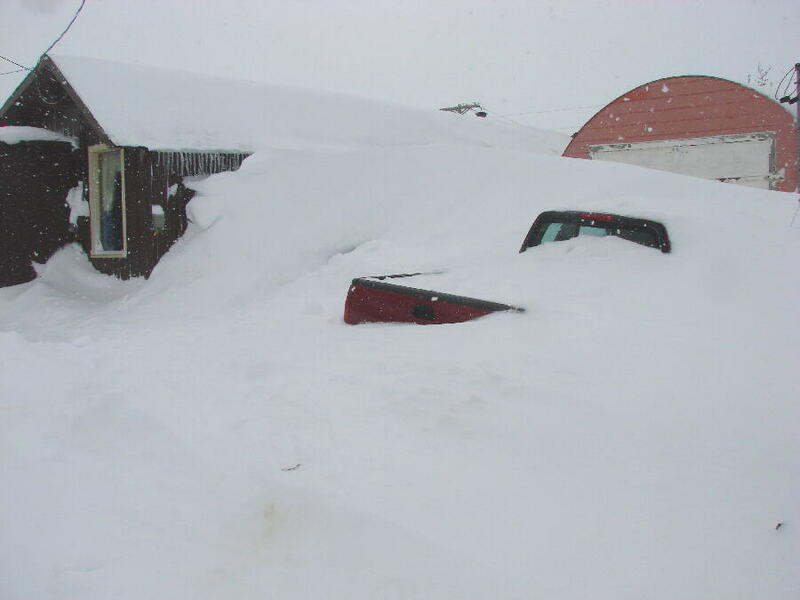 It will be 22 days to be remembered, during which a string of 13 consecutive brutal blizzards hammered Nome. Several days (except for police and KNOM), Nome just shut down. 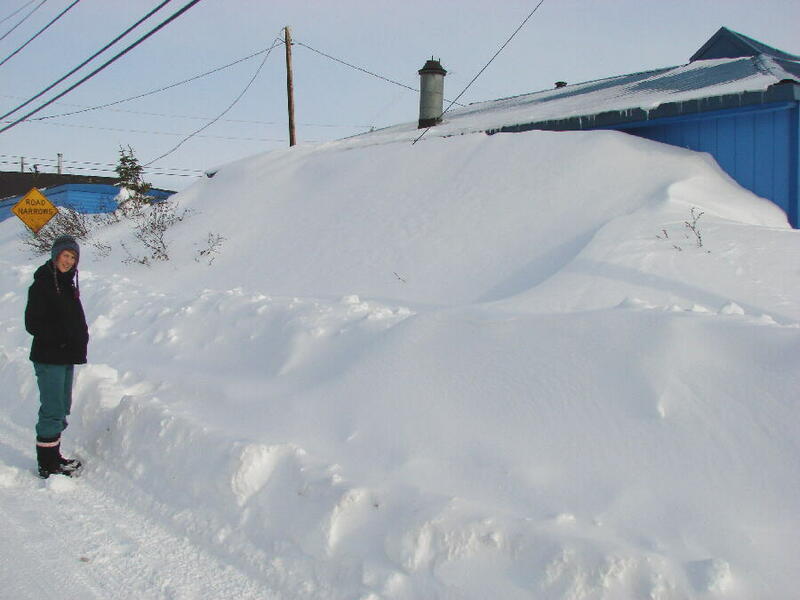 During the brief periods when winds quieted a bit, children walked up drifts to their roofs. The storms were monstrously large. Imagine shutting down air travel throughout the entire East Coast, from Maine to Alabama, and as far west as Chicago, for days at a time. We and our listeners endured them, and thanks to you, despite numerous power outages in this vast region, KNOM could be heard on battery-powered radios throughout 100,000 square miles. Well, most of the time. Please see below. Thank you so much for being a valued part of our mission, helping to keep our signal strong. God bless you for it! 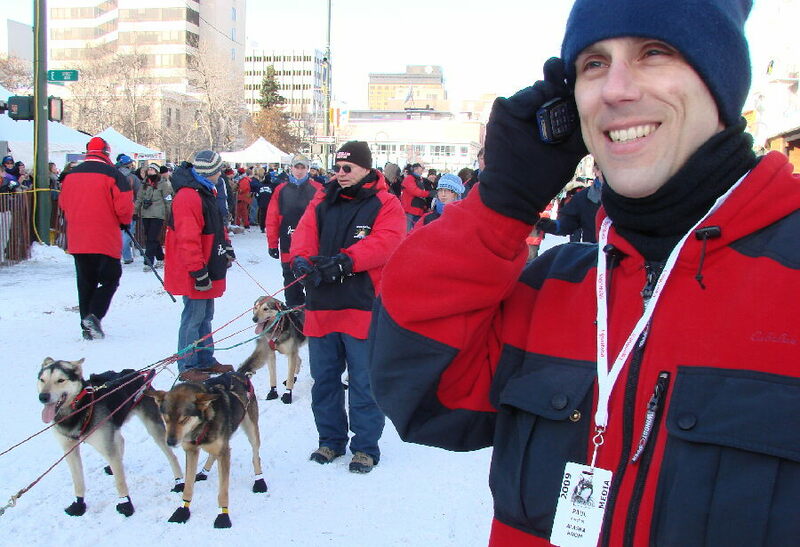 GOING TO THE DOGS: (left) Via cell phone, KNOM news director Paul Korchin reports on the Iditarod Race start from 4th Avenue in Anchorage, 539 air miles, and over 1,100 rugged trail miles, from Nome. Accompanying Paul was fellow KNOMer Laureli Kinneen (left, with Paul, providing color commentary). Together, they produced informative full length interviews with almost every competitor. 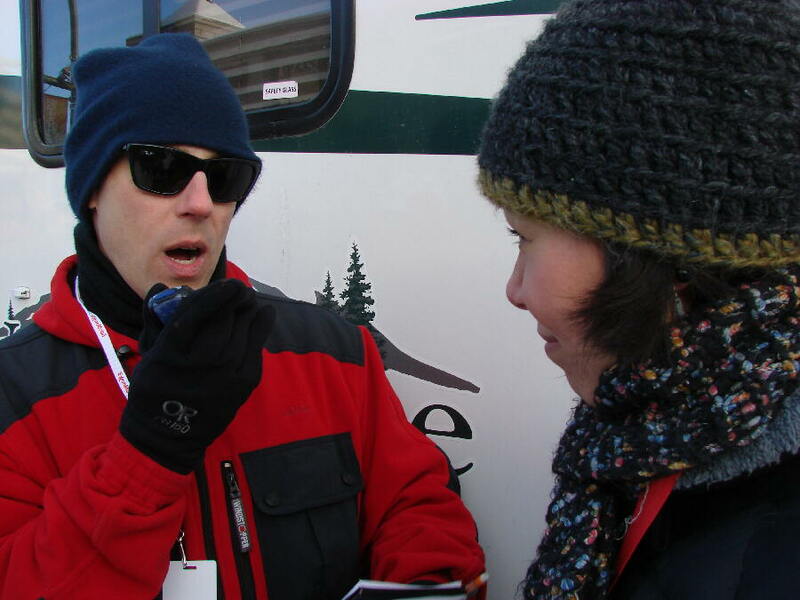 Covering the Iditarod provides our listeners a positive event on which to focus, during a time that used to be known as “suicide month” throughout villages in western Alaska. Paul has followed this wilderness event since 1998. His and Laureli’s travel expenses were covered by local underwriters. OUTAGE: We were off the air for a bit during the worst of one storm, and were surprised when many villagers called us. Universally, they used the words “where are you?” as though trying to locate a missing friend or family member. We were greatly touched to the affirmation that thanks to you, our mission signal is a constant positive influence and seen by our listeners as a valued close companion. INSPIRATIONAL SPOT: Every Christian needs a half-hour of prayer each day, except when we are busy. Then, we need an hour. INSPIRATIONAL SPOT: Since we all came into this world with nothing, everything that we have is a gift. WE GET THE DRIFT! 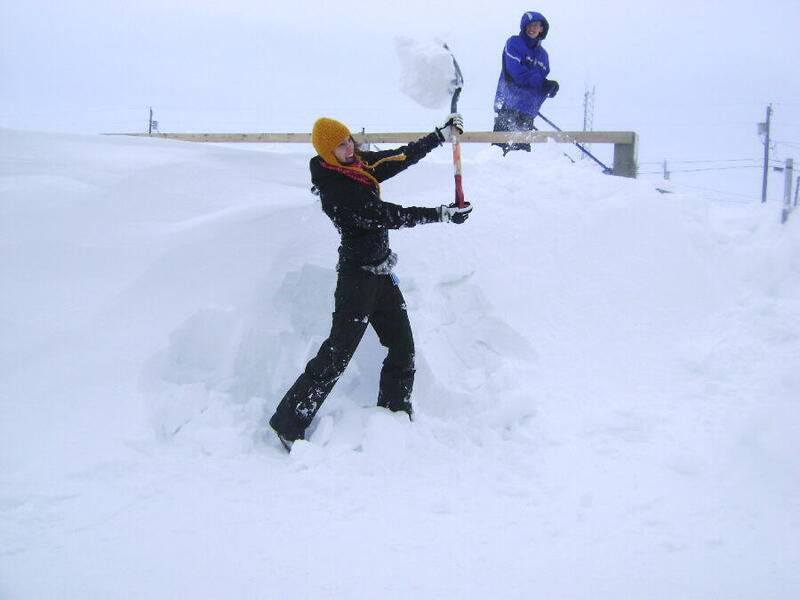 (left) Program director Kelly Brabec inspects a typical March 2009 Nome snowdrift. 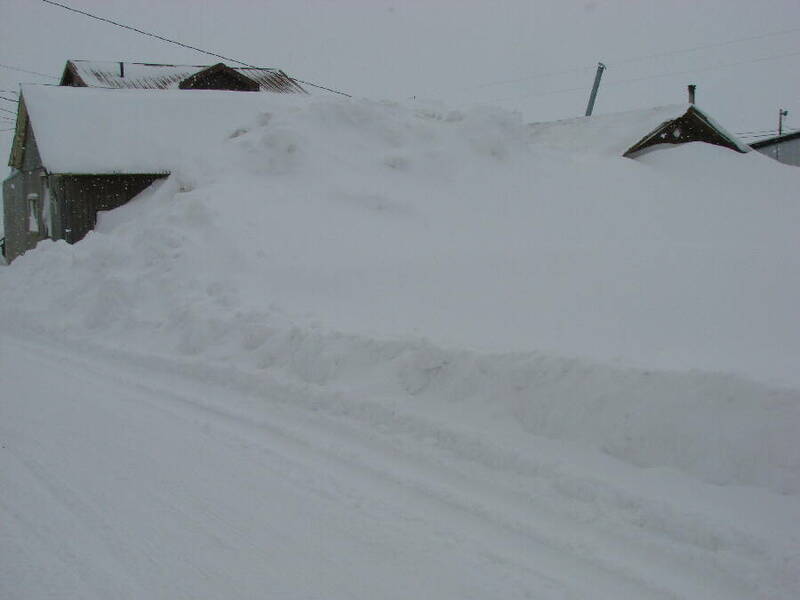 Many residents had to dig tunnels through the snow to access their front doors. Others used second-story windows to leave and enter their homes. 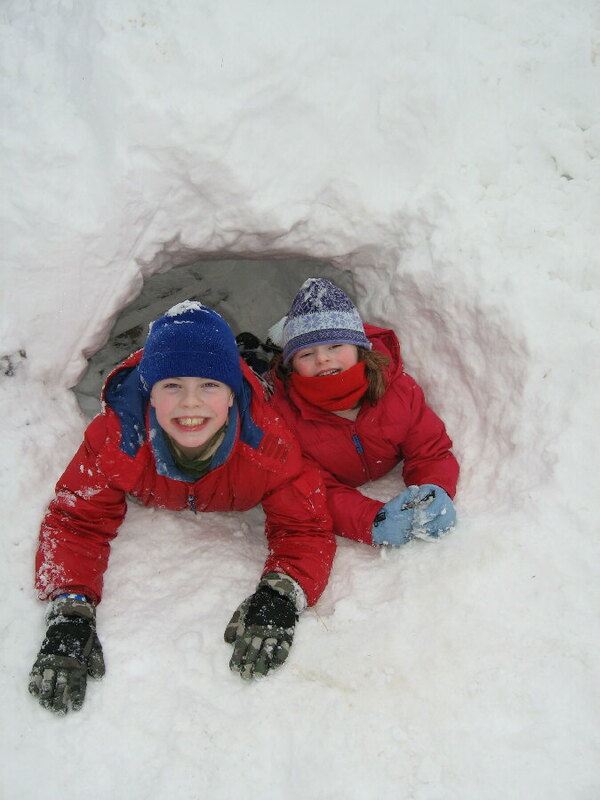 (Left) Ric and Lynette Schmidt’s offspring Tara (heaving shovel) and Sam clear the family driveway. The fence you see is 7 feet high! YES, WE HAVE ISSUES! How to develop healthy relationships. The health risks of chewing tobacco. The right to subsistence hunting. Rural energy. Employment. Emergency services. How to prevent diabetes. Elder wisdom. These are among the hundreds of topics featured in daily 10- to 15-minute interviews recently. Thank you so much for making our dissemination of this vital information possible! Please consider adding the KNOM mission to your will. We prayerfully place all bequests into funds that provide for future major improvements and protect the mission against emergencies. INSPIRATIONAL SPOT: Dear God, help me see that this is not just another day. Open my eyes so I can clearly see the unique promise that this day holds. Open my mind so I can clearly understand the message and messengers You send my way. Open my heart so I may lovingly accept the challenges, blessings and surprises that You so lovingly will provide me today. Amen. NO COMPLAINTS: (left) A few people were free of complaints about canceled flights and impassable roads, such as KNOMer Betsy Brennan’s children, John, at left, and Sarah. (Below, left) A few homes and other buildings within a block of the KNOM studio in the heart of Nome. HAVE THE CALL? Perhaps you know someone whom you think might be a great KNOM volunteer, someone who is kind, spiritual, motivated, gets along well with others in a confined environment and wishes to serve. If you do, please have them contact belong@knom.org, and we will be happy to explore the possibility with them and provide more information. GOT IT! 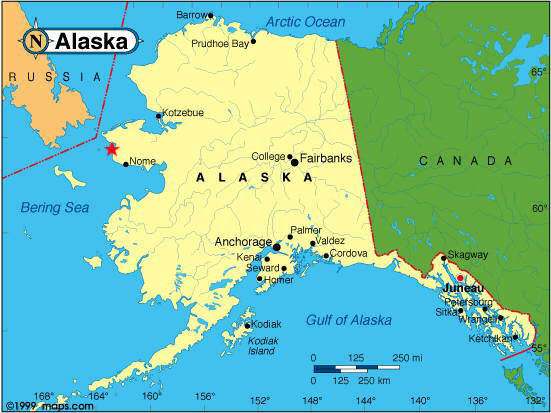 KNOM’s mission is to serve isolated western Alaskans, though we can easily be heard in places as far away as Canada’s north coast, and deep into Russia. Can you guess the chief source of interference to KNOM in Osaka? It’s a North Korean propaganda station on an adjacent frequency. Because of powerful stations on KNOM’s frequency in the Lower 48, over 38 years we have been heard only once in the Lower 48, briefly by a hobbyist in Oregon. You might be surprised to note that Nome is closer to Osaka, Japan than it is to Milwaukee, Wisconsin! EVEN FARTHER: The first week of March, we received a reception report from Kunshan City, China, which is not far from Shanghai. Kunshan is 3,800 miles away, about the distance between Nome and Washington, DC. It’s our first ever report of a listener in mainland China. INSPIRATIONAL SPOT: I am only one, but still I am one. I cannot do everything, but I can do something. Because I cannot do everything, I will not refuse to do the something I can do. 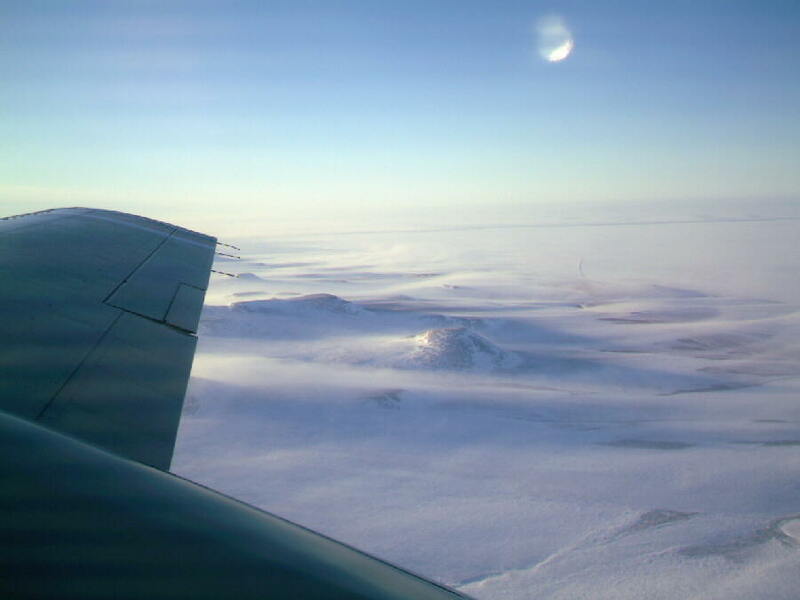 ETHERIAL: (left) There’s an ethereal quality to the wilderness landscape between Nome and Teller, as John Francis returns home by small plane, accompanied by the moon. John was returning home from covering a meeting of the Bering Strait School District, which covers an area larger than 35 U.S. states. (Left) A red star marks the location of the Inupiat (in-OO-pee-at) Eskimo village of Teller. THIRTY YEARS AGO: On April 4, 1979, KNOM airs a 15-minute interview with Alaska State Trooper Bill Farber, who travels to schools dressed in a friendly Disneyland-like Safety Bear costume. KNOMers are amused to learn that inside the merry costume, the jovial, lovable and not-too-bright Safety Bear character always packs a .38-caliber revolver. TWENTY YEARS AGO: In April 1989, volunteer news reporter Mike Jones is set to travel to a special Soviet-American ceremony, to be held on the ocean ice at the International Date Line between Alaska’s Little Diomede and the USSR’s Big Diomede Islands. 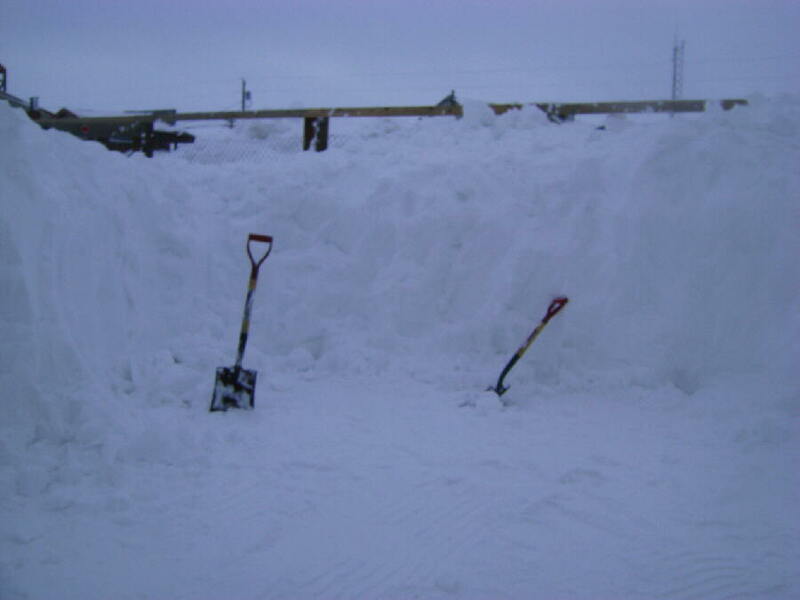 A blizzard closes in, and Mike spends six hours at the Nome airport. Mike, however, does get to chat with Alaska governor Steve Cowper, who is similarly stranded and becomes the owner of a plastic KNOM key fob. TEN YEARS AGO: April 4, 1999 is Easter Sunday. 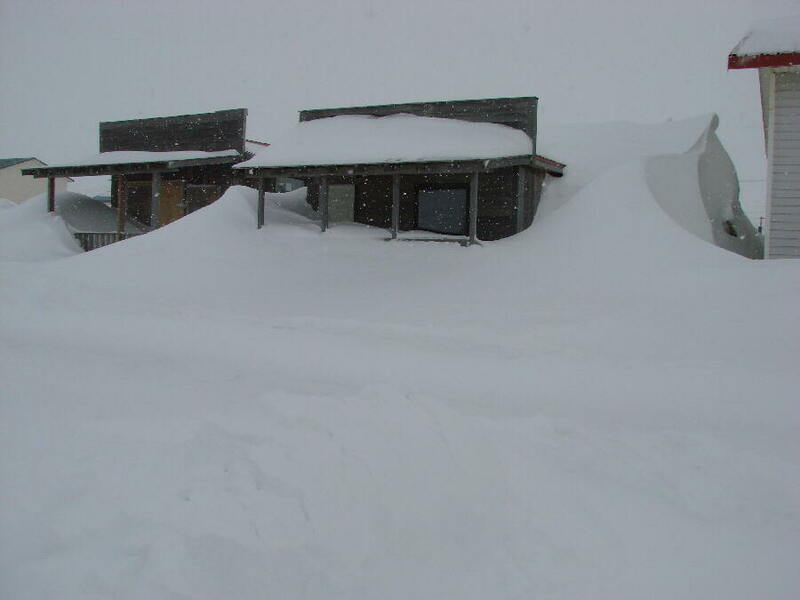 Afternoon weather is fine for Easter egg hunting, but at nightfall, a fierce blizzard suddenly roars. At KNOM’s remote transmitter site, the wind slams closed the shutters for the heat exhaust fan. By the time engineer Les Brown and volunteer Michael Warren struggle to the building in the maelstrom, waste heat has driven its temperature to 98�. Les jams the louvers open and the site cools with no ill effects. We thank you and we honor you for your kindness to our mission’s work, for you are our strength. You are in our prayers every day, and we thank you for including us in yours. May Our Heavenly Father bless you abundantly for your generosity and kindness.